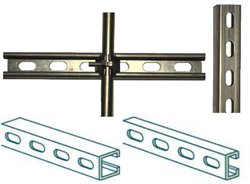 Each strut/rails or channels are used to facilitate the installation of electrical systems, pipes, fixtures; on a wall or any other type of structure. 13/16” x1⅝” & 1⅝” x1⅝” Semi-elongated holes. 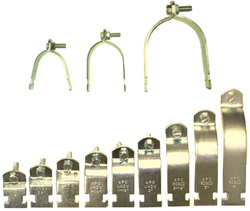 Universal strut clamps two-pieces for industrial and commercial use in the installation and assembly of pipes EMT, IMC or Rigid on rails or strut channels.